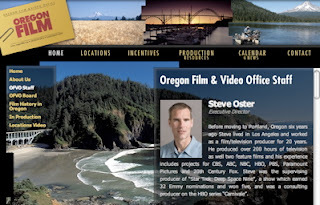 The rest of 2007 looks GREAT for film production in Oregon! We’ve already started casting on the new Jennifer Aniston flick, “Management”, starring Steve Zahn and directed by Stephen Belber. And word from the Oregon Film & Video Office is that there are two more features on the way. I got it straight from the horse’s mouth (i.e. Executive Director Steve Oster) at last Thursday’s press conference with Governor Ted Kulongoski, as the Governor was announcing the addition of actor Ed Asner (who was a hoot, by the way!) to the Film Office board of directors. One of the films can’t be discussed yet, says Steve Oster. As for the other one: apparently, we should keep our eyes peeled towards the end of the year for a certain South African actress in town….